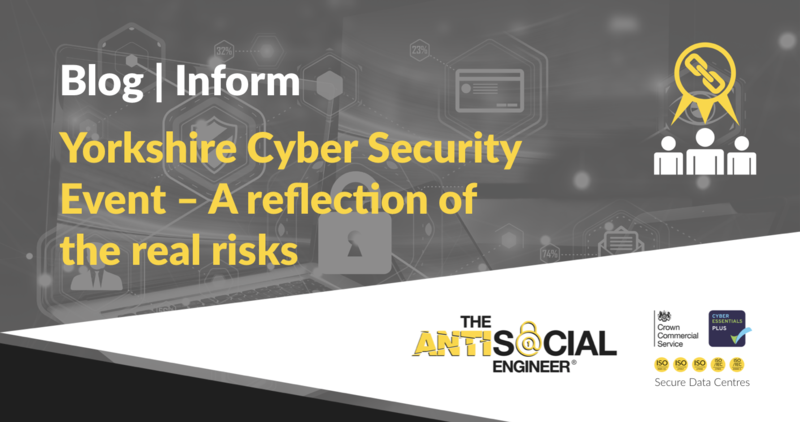 The AntiSocial Engineer Limited is supporting the Yorkshire Cyber Security Cluster to announce the first annual Yorkshire Cyber Security Event taking place on the 12th May at the 3m Buckley Innovation Centre in Huddersfield. We will be talking about our recent research into SIM Swap Fraud and sharing tips on how to keep safe online, we are even providing the refreshments as all this education is hungry work. The event, which is free to attend, aims to offer advice, help and support to local businesses and attendees on cyber security topics as well as showcasing the cluster and its capabilities. This will be achieved through a series of engaging and fun seminars, roundtable discussions and 1:1 friendly advice with cyber security experts. We’re excited to announce that we have guest speakers from the cyber security field, cryptologists and leading IT security academics, providing talks, educating the attendees on important information security topics such as human errors, cloud security and even what to do after a breach. As a founding member of the Yorkshire Cyber Security Cluster we are aware of the vital importance of protecting data from hackers and from human error. Therefore, we are incredibly proud to be a part of this captivating business event. Too many events focus on the sale of products and services, we wanted to be part of an event that focused on helping those most at risk. You will learn essential tips to keep safe online, at work and in your day to day life.